If you have a new plaster pool or just had your pool plaster resurfaced, the water balancing start-up procedure is very important to ensure the plaster cures properly. This is really the responsibility of your builder or plasterer – BUT you might have to carry out some of these maintenance steps yourself, so we will briefly go through them so that you will know what is involved and understand the general process. If you can, you should talk to your builder, or the plaster company, and ask them what they recommend. They presumably have a warranty and you don’t want to do anything that might void the warranty. If they tell you to do something, you generally should, regardless of what we say, otherwise you risk voiding the warranty. From time to time the advice offered by pool builders may leave some room for improvement. During times that you may question the advice offered by your builder you should be open and honest with them. Never should you feel shy to question any part of the process. Communication is key! Fill the pool. The pool should be filled as quickly as possible, without stopping. Use multiple hoses if possible. Do not allow water from the hose to spray directly onto the fresh plaster. If you allow the pool to only be partially filled a ring could develop around the pool at the fill level and will be difficult to impossible to remove without an acid bath. When the pool is full, add a startup dose of sequestrant. Iron and other metals can be very hard to detect and if you were to develop any stains on a newly plastered pool they are very difficult to remove. The use of sequestrant is cheap insurance for startup. The heater should not be operated for about 2 weeks after filling. If practical, bypass the heater during this period. Newly plastered pools will create a lot of plaster dust and this dust can find it’s way into the smaller tubes of your heater clogging it up. By bypassing your heater you avoid the risk of damage to your heater. No swimming until the water is properly balanced. After the pool is fully filled with water run a set of tests using your own FAS/DPD kit to make sure the water is sanitary and isn’t acidic. Once your water is balanced you can enjoy your pool. Brush the entire pool at least twice a day for the first week and at least once a day for the rest of the first month. Make sure to brush the entire plaster surface. Brush from the top of the walls down and from the shallow to the deep end to knock off any loose plaster dust. Do not SLAM (or shock) the pool during the first 30 days. If you have a SWG, do NOT add salt, or turn on the SWG, until 30 days after the pool has been filled with water. Much like the heater SWG’s can become damaged by plaster dust. To be safe use liquid chlorine to maintain the water at startup. Do not use any automated cleaning system, built-in or robotic, during the first two weeks. For the remaining rules, you need to know which start-up method your builder is using: acid, traditional, or bicarbonate. The procedures for each are different. Your builder might use a variation of these procedures so be sure to follow their instructions if they differ from these. Your builder will normally take care of the first five steps and then turn it over to you. Check all equipment and make sure it’s functional. Circulate the water, add sequestrant. Run pump 24 hours a day for first week. Watch the filter pressure and clean the filter as soon as it rises 20% to 25% over the starting pressure and right after vacuuming. The plaster dust might clog the filter quickly so keep an eye on it and clean the filter as needed. After the first 48 hours vacuum daily before brushing using a vacuum head with brushes (such as used in vinyl pools) instead of wheels to prevent marring the plaster. Clean filter after vacuuming. After 72 hours add the CYA and then the chlorine SLOWLY to gradually bring it to the desired level. Continue to brush, vacuum, test water balance, and clean the filter for one to two weeks, or 3 days after you see no plaster dust coming off when you brush. This start-up procedure should only be used for exposed aggregate and pebble finishes only. Your builder usually handles this delicate and difficult procedure. This procedure does run the risk of damaging the plaster and should be avoided if possible. For more information please review this thread on the forum. Leave the pump off at first. 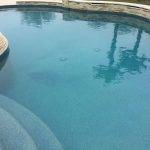 After the pool has been filled, add 3 gallons of muriatic acid (31.5%) per 10,000 gallons and then brush the entire pool. The acid will help dissolve the plaster dust. Brush twice daily but don’t vacuum or add chlorine until plaster dust is gone. For dark plaster only brush lighter colored or white areas. When all plaster dust is gone, neutralize the acid with sodium bicarbonate and a small amount of soda ash by using a base demand test, wait 24 hours and repeat if needed. When the PH rises to 7.2, check all equipment and turn on the circulation system. Clean the filter when the pressure increases 20% to 25% over the starting pressure. Add sanitizer in small amounts at first until the desired level is obtained. The bicarbonate start-up is a relatively new approach, not as common as the two above. It is a rather technical process that requires some special equipment so we will only list the procedures from the point the pool owner might be expected to take over. It is especially useful with dark plaster. The Bicarb start-up raises the alkalinity level as the pool fills with water. Maintain TA between 150-300 ppm and pH below 8.2 for first month. After three weeks, lower TA slowly to desired level by adding acid in small amounts. This will gradually lower the TA over a period of time. Scale will not form if the pH is always kept below 8.2. Once TA is at desired range adjust pH to 7.4 to 8.0. No matter what start-up procedure is used, your pool will consume a lot of acid during the first 6-12 months as the plaster finish continues to cure. It is important to test your pH daily and do not let it climb above 7.8. Be sure to continue to brush the pool at least weekly during this period.